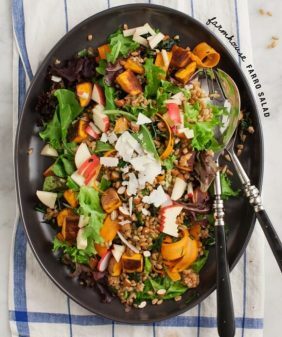 This salad is loosely inspired by a carrot salad I ate during a trip to Morocco a couple of years ago. It was part of our first night’s dinner… a hot night (114 degrees!) on the rooftop of our Riad at sunset. There were marinated vegetable salads, flatbreads, tagines, and a bottle of moroccan rose… all while the evening prayer chanted over a loudspeaker in the distance. We might as well have been on another planet, it felt so surreal. Yet, one of the things I remember most about that night was the carrot salad. 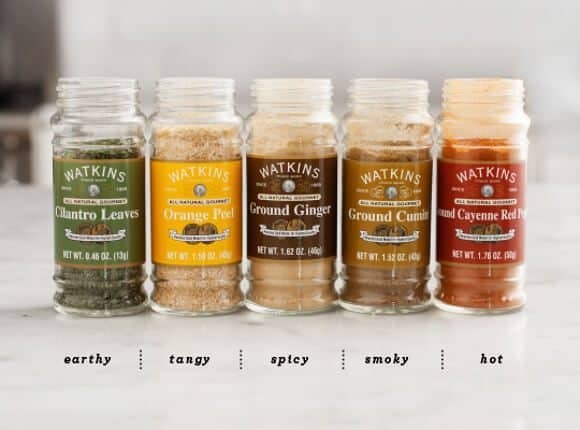 Recently, J.R. Watkins asked me to create a dish using their new line of dried herbs and spices. Since I already buy their natural home products (package designs to die for), I was super excited to try the spices. Immediately, I knew it was time to make a version of that carrot salad. Beautiful local spring carrots, big squeezes of lemon, and fresh mint perfectly balance the aromatic herbs and spices. I also added some sweet currants, toasted almonds, and some chickpeas and couscous to make it a full meal. Special thanks to J.R. Watkins for partnering on this post. Cook your couscous. Place israeli couscous in a medium pot over medium heat. Before adding water, let it toast (dry) for a minute or so. Fill the pot with enough water to well cover the couscous. Add a pinch of salt, bring to a boil and reduce to a simmer for about 8 minutes. Drain. Toss with a little oil, and set aside. In a small skillet add cumin, ginger, orange peel and cayenne. Warm spices in the pan for just 30 seconds or so. Add the olive oil oil (enough to coat), and heat it for 30 seconds until the oil barely comes to a simmer. Remove from heat, scrape the oil & herbs into a small bowl with a smashed clove of fresh garlic (you're going to remove the garlic clove before using the dressing). Let cool for a few minutes and add dried cilantro, salt, pepper & a few good squeezes of lemon. 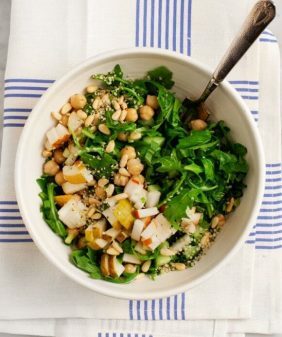 Toss half of the dressing of the dressing with cooked chickpeas & couscous. Let it marinate in the fridge for 20 minutes or so while you peel your carrots. Remove the garlic clove from the remainder of the dressing. 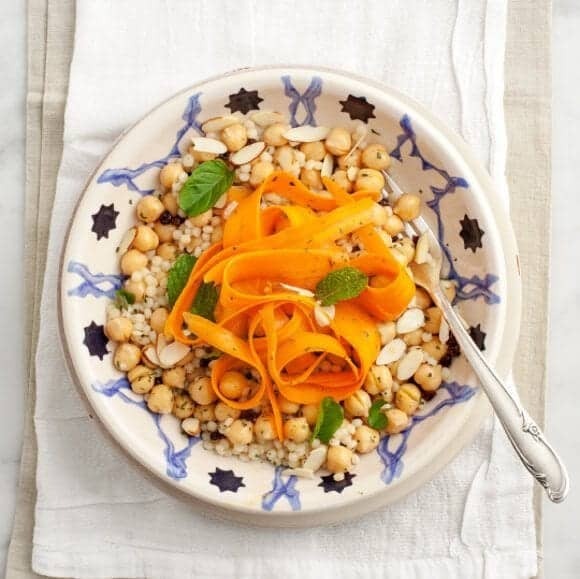 Toss everything together - couscous & chickpeas, carrot ribbons, currants, toasted almonds, and fresh mint. Taste and adjust seasonings. That carrot… I could eat all alone with those spices. I neeeeeeed that dried orange peel! I am adding it to the grocery list! I just loved the dried orange peel! I’d never cooked with it before so I was excited to discover a new (to me) ingredient. i’m always interested in creating different flavor profiles using various spices in conjunction with one another. this combination sounds great! me too… I just loved playing around with some new ones! 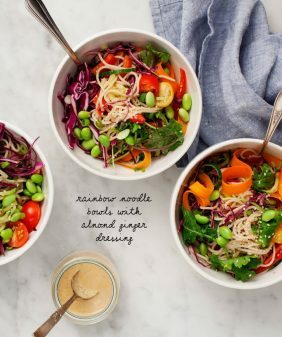 Such a beautiful photo and the recipe sounds right up my alley! So pretty! I love the earthy flavors. So yummy! Looks delicious!! I agree about those carrots, I could eat them by themselves but they look perfect with the rest of the dish! This salad is just beautiful! 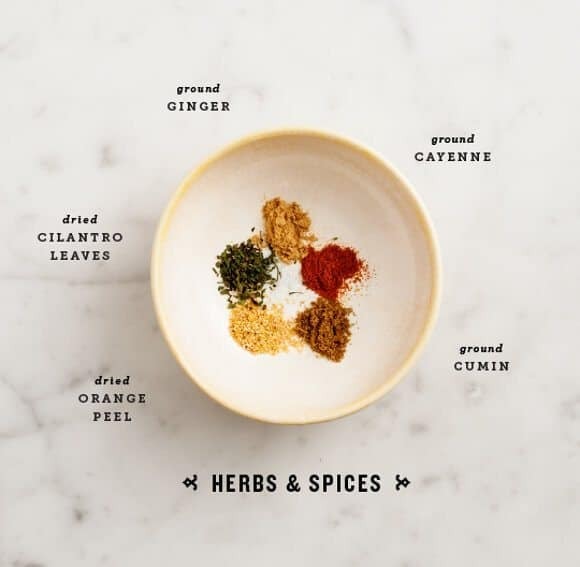 I love the variety of spices you used – what a complex flavor! Your photos are stunning! I love all the colors in this salad, it’s so beautiful. 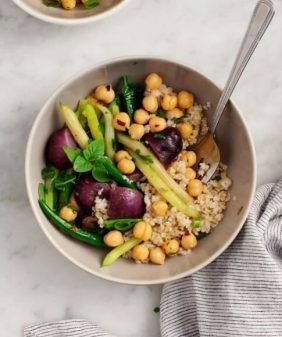 I recently came across gluten-free couscous and it literally stopped me dead in my tracks at the grocery store. I was so excited to have it. I will have to try and find it again, so I can make this. 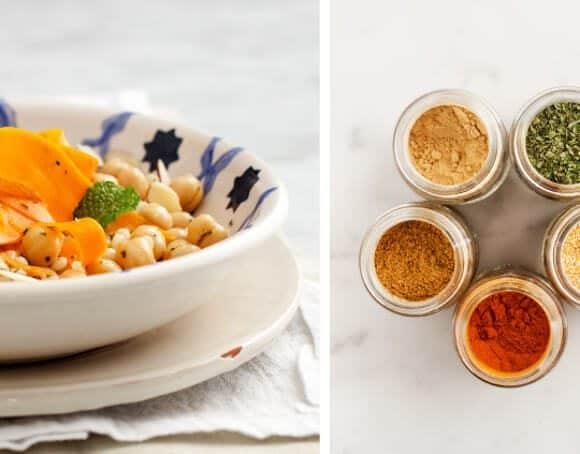 I love israeli couscous, and anything moroccan-inspired. 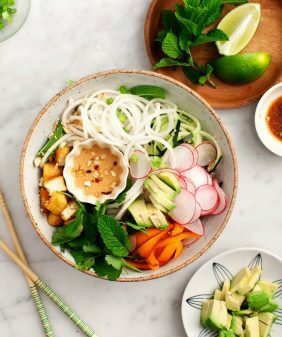 This salad looks beautiful, thanks for sharing! Very interesting combination of flavors. I made this recipe last night and loved it! Totally reminds me of the long weekend I spent in Marrakech last year. 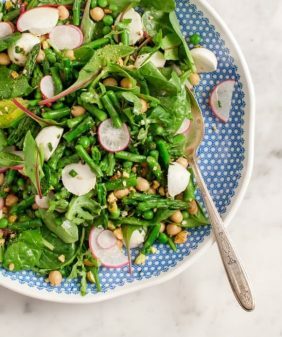 I’ve been wanting to recreate the salads I had there for so long but didn’t know where to start! Great recipe and blog! Totally screwed up and used the wrong kind of couscous… No wonder the recipe wasn’t making much sense as I made it. Ah well, still tastes good. Just not as hearty.